PARRISH, Fla., Feb. 20, 2017 /PRNewswire/ -- Florida Power & Light Company, the largest generator of solar energy in Florida, today announced the expansion of its near-term plans for new universal solar generation. FPL now plans to build new universal solar power plants at eight locations by early 2018 – comprising more than 2.5 million solar panels. "We have been working hard to drive down the costs of adding solar so we can deliver even more zero-emissions energy to all of our customers. As the first company to build solar power generation cost effectively in Florida, we are proud to continue leading the advancement of affordable clean energy infrastructure. We have proven that it's possible to cut emissions and deliver reliable service while keeping electric bills low for our customers," said Eric Silagy, FPL president and CEO, during a celebration at the FPL Manatee Solar Energy Center, one of the company's three most recently completed solar power plants. FPL consistently ranks as one of the cleanest, most reliable energy providers in the nation, and the price that FPL's typical 1,000-kWh residential customer pays for electricity continues to be less than it was more than 10 years ago and well below the latest national average. Furthering this trend, the new solar energy centers FPL plans to build are projected to be cost-effective over their operational lifetime, producing millions of dollars in long-term net savings for FPL customers. Each of the eight new solar plants will be 74.5 megawatts in capacity for a total of nearly 600 megawatts, which is enough to power approximately 120,000 homes. The plants will be located at sites across Florida, including three previously announced locations in Alachua, Putnam and DeSoto counties. The locations of all of the new sites will be announced in the coming weeks. Construction is expected to commence this spring. During peak construction, an estimated 200 to 250 people will be working at each site. 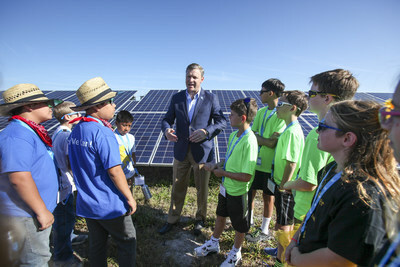 FPL announced its accelerated solar plans at a community event held today with hundreds of students and leaders from across the state who gathered to celebrate the company's latest completed solar power plants – FPL Manatee Solar Energy Center, FPL Citrus Solar Energy Center and FPL Babcock Ranch Solar Energy Center, all of which began powering FPL customers on Dec. 31, 2016. "A year ago, I stood here as FPL broke ground on this solar site, marking the start of the installation of one million solar panels that are now producing zero-emissions energy," said Eric Draper, executive director of Audubon Florida, at the celebration today. "An additional eight new solar energy centers is a major step toward reducing carbon emissions and saving water, benefitting the earth and all Floridians." Building on FPL's long-standing commitment to STEM (science, technology, engineering and math) education, the celebration event also included a solar-powered competition co-sponsored by the Florida Solar Energy Center. Nearly 50 teams of students in grades 4 through 12 from schools across the state participated in the competition, building solar ovens, solar race cars and other innovative projects. FPL's innovative approach to investing in affordable clean energy infrastructure since 2001, which includes adding advanced technologies and phasing out older coal-fired and oil-burning power plants, has saved FPL customers more than $8.6 billion in fossil fuel costs and prevented 108 million tons of carbon emissions. Today, FPL is cleaner than the carbon emissions goal set by the U.S. Environmental Protection Agency's Clean Power Plan for Florida to meet by 2030, while the company's typical residential customer bills are among the lowest in the nation. In addition, FPL has installed small-scale solar arrays for more than 100 Florida schools and other educational facilities. The company also sponsors 50 robotics teams or clubs and a traveling science show that performs for approximately 80,000 grade school students each year. For more information, visit www.FPL.com/solar. Florida Power & Light Company is the third-largest electric utility in the United States, serving approximately 4.9 million customer accounts or an estimated 10 million people across nearly half of the state of Florida. FPL's typical 1,000-kWh residential customer bill is approximately 25 percent lower than the latest national average and, in 2016, was the lowest in Florida among reporting utilities for the seventh year in a row. FPL's service reliability is better than 99.98 percent, and its highly fuel-efficient power plant fleet is one of the cleanest among all utilities nationwide. The company received the top ranking in the southern U.S. among large electric providers, according to the J.D. Power 2016 Electric Utility Residential Customer Satisfaction Study(SM), and was recognized in 2016 as one of the most trusted U.S. electric utilities by Market Strategies International. A leading Florida employer with approximately 8,900 employees, FPL is a subsidiary of Juno Beach, Florida-based NextEra Energy, Inc. (NYSE: NEE), a clean energy company widely recognized for its efforts in sustainability, ethics and diversity, and has been ranked No. 1 in the electric and gas utilities industry in Fortune's 2017 list of "World's Most Admired Companies." NextEra Energy is also the parent company of NextEra Energy Resources, LLC, which, together with its affiliated entities, is the world's largest generator of renewable energy from the wind and sun. For more information about NextEra Energy companies, visit these websites: www.NextEraEnergy.com, www.FPL.com, www.NextEraEnergyResources.com. This news release contains "forward-looking statements" within the meaning of the safe harbor provisions of the Private Securities Litigation Reform Act of 1995. Forward-looking statements are not statements of historical facts, but instead represent the current expectations of NextEra Energy, Inc. (NextEra Energy) and Florida Power & Light Company (FPL) regarding future operating results and other future events, many of which, by their nature, are inherently uncertain and outside of NextEra Energy's and FPL's control. In some cases, you can identify the forward-looking statements by words or phrases such as "will," "may result," "expect," "anticipate," "believe," "intend," "plan," "seek," "aim," "potential," "projection," "forecast," "predict," "goals," "target," "outlook," "should," "would" or similar words or expressions. You should not place undue reliance on these forward-looking statements, which are not a guarantee of future performance. The future results of NextEra Energy and FPL and their business and financial condition are subject to risks and uncertainties that could cause their actual results to differ materially from those expressed or implied in the forward-looking statements, or may require them to limit or eliminate certain operations. These risks and uncertainties include, but are not limited to, the following: effects of extensive regulation of NextEra Energy's and FPL's business operations; inability of NextEra Energy and FPL to recover in a timely manner any significant amount of costs, a return on certain assets or a reasonable return on invested capital through base rates, cost recovery clauses, other regulatory mechanisms or otherwise; impact of political, regulatory and economic factors on regulatory decisions important to NextEra Energy and FPL; disallowance of cost recovery by FPL based on a finding of imprudent use of derivative instruments; effect of any reductions to, or elimination of, governmental incentives or policies that support utility scale renewable energy projects of NextEra Energy Resources, LLC and its affiliated entities (NextEra Energy Resources) or the imposition of additional taxes or assessments on renewable energy; impact of new or revised laws, regulations, interpretations or other regulatory initiatives on NextEra Energy and FPL; effect on NextEra Energy and FPL of potential regulatory action to broaden the scope of regulation of over-the-counter (OTC) financial derivatives and to apply such regulation to NextEra Energy and FPL; capital expenditures, increased operating costs and various liabilities attributable to environmental laws, regulations and other standards applicable to NextEra Energy and FPL; effects on NextEra Energy and FPL of federal or state laws or regulations mandating new or additional limits on the production of greenhouse gas emissions; exposure of NextEra Energy and FPL to significant and increasing compliance costs and substantial monetary penalties and other sanctions as a result of extensive federal regulation of their operations; effect on NextEra Energy and FPL of changes in tax laws and in judgments and estimates used to determine tax-related asset and liability amounts; impact on NextEra Energy and FPL of adverse results of litigation; effect on NextEra Energy and FPL of failure to proceed with projects under development or inability to complete the construction of (or capital improvements to) electric generation, transmission and distribution facilities, gas infrastructure facilities or other facilities on schedule or within budget; impact on development and operating activities of NextEra Energy and FPL resulting from risks related to project siting, financing, construction, permitting, governmental approvals and the negotiation of project development agreements; risks involved in the operation and maintenance of electric generation, transmission and distribution facilities, gas infrastructure facilities and other facilities; effect on NextEra Energy and FPL of a lack of growth or slower growth in the number of customers or in customer usage; impact on NextEra Energy and FPL of severe weather and other weather conditions; threats of terrorism and catastrophic events that could result from terrorism, cyber attacks or other attempts to disrupt NextEra Energy's and FPL's business or the businesses of third parties; inability to obtain adequate insurance coverage for protection of NextEra Energy and FPL against significant losses and risk that insurance coverage does not provide protection against all significant losses; a prolonged period of low gas and oil prices could impact NextEra Energy Resources' gas infrastructure business and cause NextEra Energy Resources to delay or cancel certain gas infrastructure projects and for certain existing projects to be impaired; risk to NextEra Energy Resources of increased operating costs resulting from unfavorable supply costs necessary to provide NextEra Energy Resources' full energy and capacity requirement services; inability or failure by NextEra Energy Resources to manage properly or hedge effectively the commodity risk within its portfolio; potential volatility of NextEra Energy's results of operations caused by sales of power on the spot market or on a short-term contractual basis; effect of reductions in the liquidity of energy markets on NextEra Energy's ability to manage operational risks; effectiveness of NextEra Energy's and FPL's risk management tools associated with their hedging and trading procedures to protect against significant losses, including the effect of unforeseen price variances from historical behavior; impact of unavailability or disruption of power transmission or commodity transportation facilities on sale and delivery of power or natural gas by FPL and NextEra Energy Resources; exposure of NextEra Energy and FPL to credit and performance risk from customers, hedging counterparties and vendors; failure of NextEra Energy or FPL counterparties to perform under derivative contracts or of requirement for NextEra Energy or FPL to post margin cash collateral under derivative contracts; failure or breach of NextEra Energy's or FPL's information technology systems; risks to NextEra Energy and FPL's retail businesses from compromise of sensitive customer data; losses from volatility in the market values of derivative instruments and limited liquidity in OTC markets; impact of negative publicity; inability of NextEra Energy and FPL to maintain, negotiate or renegotiate acceptable franchise agreements with municipalities and counties in Florida; increasing costs of health care plans; lack of a qualified workforce or the loss or retirement of key employees; occurrence of work strikes or stoppages and increasing personnel costs; NextEra Energy's ability to successfully identify, complete and integrate acquisitions, including the effect of increased competition for acquisitions; NextEra Energy Partners, LP's (NEP's) acquisitions may not be completed and, even if completed, NextEra Energy may not realize the anticipated benefits of any acquisitions; environmental, health and financial risks associated with NextEra Energy Resources' and FPL's ownership and operation of nuclear generation facilities; liability of NextEra Energy and FPL for significant retrospective assessments and/or retrospective insurance premiums in the event of an incident at certain nuclear generation facilities; increased operating and capital expenditures at nuclear generation facilities of NextEra Energy or FPL resulting from orders or new regulations of the Nuclear Regulatory Commission; inability to operate any of NextEra Energy Resources' or FPL's owned nuclear generation units through the end of their respective operating licenses; liability of NextEra Energy and FPL for increased nuclear licensing or compliance costs resulting from hazards, and increased public attention to hazards, posed to their owned nuclear generation facilities; risks associated with outages of NextEra Energy Resources' and FPL's owned nuclear units; effect of disruptions, uncertainty or volatility in the credit and capital markets on NextEra Energy's and FPL's ability to fund their liquidity and capital needs and meet their growth objectives; inability of NextEra Energy, FPL and NextEra Energy Capital Holdings, Inc. to maintain their current credit ratings; impairment of NextEra Energy's and FPL's liquidity from inability of credit providers to fund their credit commitments or to maintain their current credit ratings; poor market performance and other economic factors that could affect NextEra Energy's defined benefit pension plan's funded status; poor market performance and other risks to the asset values of NextEra Energy's and FPL's nuclear decommissioning funds; changes in market value and other risks to certain of NextEra Energy's investments; effect of inability of NextEra Energy subsidiaries to pay upstream dividends or repay funds to NextEra Energy or of NextEra Energy's performance under guarantees of subsidiary obligations on NextEra Energy's ability to meet its financial obligations and to pay dividends on its common stock; the fact that the amount and timing of dividends payable on NextEra Energy's common stock, as well as the dividend policy approved by NextEra Energy's board of directors from time to time, and changes to that policy, are within the sole discretion of NextEra Energy's board of directors and, if declared and paid, dividends may be in amounts that are less than might be expected by shareholders; NEP's inability to access sources of capital on commercially reasonable terms could have an effect on its ability to consummate future acquisitions and on the value of NextEra Energy's limited partner interest in NextEra Energy Operating Partners, LP; and effects of disruptions, uncertainty or volatility in the credit and capital markets on the market price of NextEra Energy's common stock. NextEra Energy and FPL discuss these and other risks and uncertainties in their annual report on Form 10-K for the year ended December 31, 2015 and other SEC filings, and this news release should be read in conjunction with such SEC filings made through the date of this news release. The forward-looking statements made in this news release are made only as of the date of this news release and NextEra Energy and FPL undertake no obligation to update any forward-looking statements.